Stereoselective carbon-carbon bond formation is the most important problem. We have been investigated the construction of carbon chain having contiguous stereogenic centers using the reaction of acylsilanes. For example, the usual aldol reaction of acylsilanes proceeds to afford the corresponding 1,3-diol derivatives having three contiguous stereogenic centers via tandem Tishchenko reaction. On the other hand, the Mukaiyama aldol reaction of acylsilanes and the following nucleophilic addition also gave the diol derivatives with high stereoselectivity. 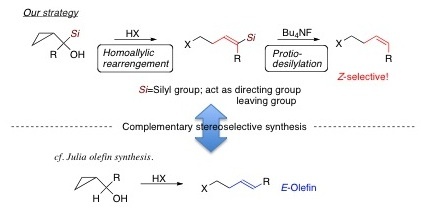 Stereoselective olefin synthesis is the most important subject in synthetic organic chemistry. We have been investigated the stereoselective synthesis of homoallyl derivatives using the homoallylic rearrangement of cyclopropylcarbinyl cations having a silyl group on a carbinyl carbon. For example, cyclopropylsilylmethanols having a n-, s-butyl or phenyl group on the carbinyl carbon react to afford the E-homoallyl derivatives selectively. On the other hand, the reaction of cyclopropylsilylmethanols having a tert-butyl group gives Z-isomers exclusively. Furthermore, the following protiodesilylation of the resulting homoallyl derivatives proceeds with retention of configuration. Fluorous chemistry is one of the most important discipline in green chemistry. We have been investigated that the utilization of silyl groups having perfluoroalkyl group on silicon atom as a fluorous tag in fluorous synthesis. For example, the synthesis of acylsilanes having fluorous groups on silicon atom were accomplished. The desired acylsilanes were easily separated from reaction mixture via liquid-liquid extraction between a common oraganic and a fluorous solvent in the synthesis. Further synthetic application of resulting acylsilanes was investigated now.